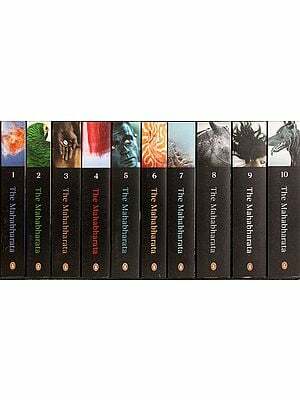 The Mahabharata is an Itihasa which holds fascination for scholars of different disciplines. There is material here, in this vast text, for anthropologists, sociologists, philosophers, scholars of religious studies, astrophysicists and many more. While earlier scholarship has mainly been in the fields of religion and philosophy and in the dating of the Itihasa, since the publication of the critical edition, scholars have been engaged in researching its contents both critically and comparatively in very much areas and in novel ways. 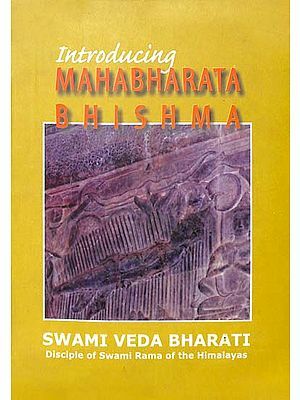 This book, which is a collection of essays by scholars reputed in the area of Mahabharata studies, belongs to this new genre. There are chapter, here, that explore the hermeneutics of dharma, other which try to analyze different characters from many perspectives, one which revisits the dating of the Kuruksetra war using latest computer technology, another one which discusses the birth of the Pandavas and the Kauravas in modern bioethical terms, and many other topics as well. This book is thus an addition to the ongoing scholarship is understanding the inexhaustible material available to us is this unique Mahabharata text that represents in many ways, the cultural history of India. 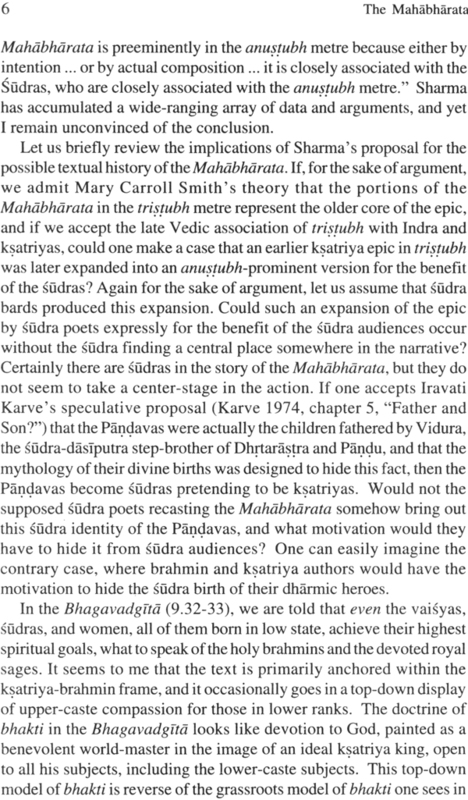 Though ancient, the Mahabharata is modern in the challenges it presents to scholars of all ages. 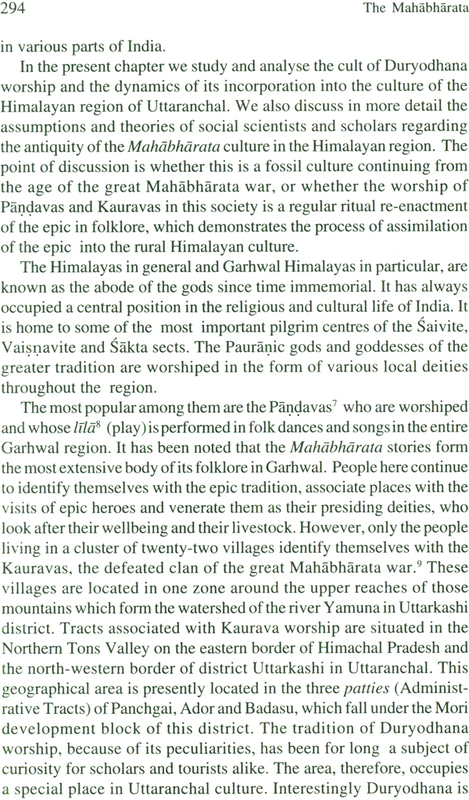 It is a book which also caters to the general reader interested in the Itihasa tradition. Dr. T.S. Rukmani is currently Professor and Chair in Hindu Studies at Concordia University, Montreal, Canada. Before joining the present assignment she had the distinction of being the first Chair in Hindu Studies and Indian Philosophy at the University of Durban-Westville, South Africa. She has had a distinguished academic career at the University of Delhi where her last assignment was Principal, Miranda House. She is the author of twelve books which include the Yogavarttika of Vijnanabhiksu in 4 vols. (1981-89), the Yogasutra-bhasyavivarana of Sankara in 2 vols. 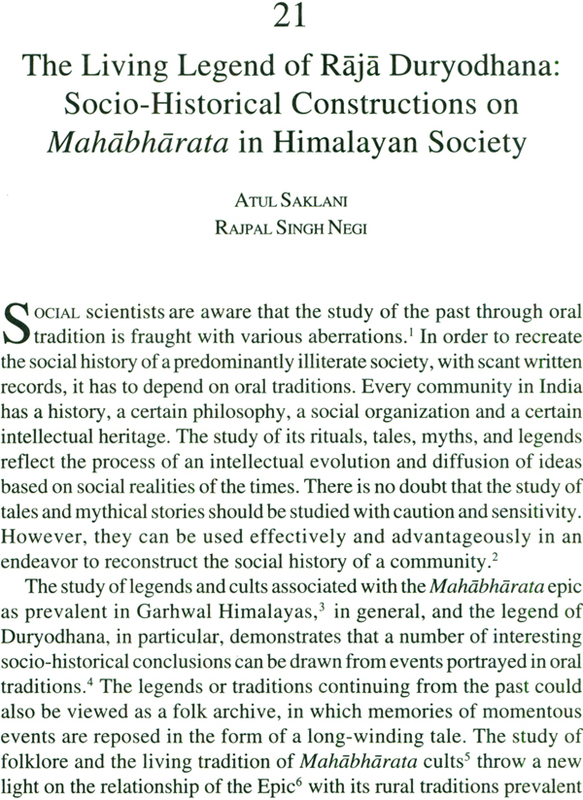 (2001), and Hindu Diaspora: Global Perspectives (2001). She has many research papers to her credit and publishes regularly in academic journals both in India and abroad. Besides her research in areas of Indian philosophy, Rukmani had had an abiding interest in Itihasa and Purana studies. This book is a result of her ongoing engagement with the Mahabharata material. THIS volume is the outcome of a highly successful International Conference on the Mahabharata held at Concordia University, Montreal (Canada) on 18th, 19th and 20th May 200l. The Conference involving thirty-three presenters had delegates from a number of countries like America, Australia, Canada, England, India, Israel, Japan, and Mauritius andit covered a wide array of topics. The presentations and discussions mainly focussed on (1) Methodological Perspectives; (2) Character Analysis and (3) Philosophical, Social, Ethical and other issues in this great itihasa. Prof. Frederick Lowy, the Rector and Vice-Chancellor of Concordia University inaugurated the Conference which was followed by Prof. Gerald James Larson's keynote address entitled " ... kim akurvata, Samjaya? : The Great War in the Night of a Thousand Suns." Three days of intense intellectual debate (jnanayajna) concluded with Prof. Madhav Deshpande' s valedictory address titled "Interpreting the Mahabharata." A conference of this dimension and scope would not have been possible without a generous financial grant from the Social Sciences and Humanities Research Council (SSHRC) of Canada and also support from the Faculty of Arts and Sciences of Concordia University. I thank them for their support. Though as Chair in Hindu Studies, I was primarily responsible for the organization of this event, its success was due to the unstinted effort and organizational skills of a number of other people, both within and outside the University community. It is not possible to name all of those who helped me in this event, but there are some who were directly involved and need special mention. Amongst them are Dr. Srinivas Tilak and Ms. Johanne Rabbat who were the coordinators of the Conference; Dr. Tilak was a faculty member at the time and Johanne is a graduate student in the department working on her doctoral thesis. A number of the members of the community worked tirelessly on all three days of the Conference, taking care of all the practical little things like registration, tea and coffee breaks, catering arrangements and so many of those minute details that go to make a successful Conference. Due to constraint of space I regret that I am not able to mention all of them by name and am certain that they will appreciate my difficulty. I would like to thank Munit Merid, the Secretary of the Department of Religion, Concordia University, for the initial, painstaking, editing of the chapters of the volume and Ms. Johanne Rabbat who took over from her in the middle, and worked with me right till the time that the manuscript was dispatched to the Publishers. I sincerely thank both of them for their efforts. Late Mr. Devendra Jain of Munshiram Manoharlal Publishers, New Delhi, well-known Publishers of Indological books, came forward and accepted to publish this work. I thank him for the interest he had shown in this publication. 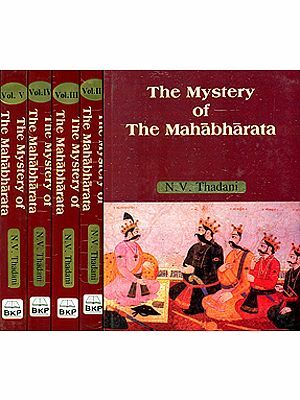 THE critical edition of the Mahabharata (Mbh.) brought out by the Bhandarkar Oriental Research Institute, Pune, is a milestone in the history of Mbh. scholarship which has since driven a number of innovative research in the vast treasures of this itihasa all round the world. From viewing the Mbh. as a "monstrous mass of songs" in the past, for instance, it has widened the lens, and scholars are now more interested in looking for answers for specific questions that beset all humans that live in this complex world. The approach now is not that the Mbh. is a culture-specific text applicable only to the Indian context as such but that the text is indeed engaged in portraying the complexities and dilemmas that each one of us faces in the lived world. There is no other text, perhaps, more suited to guide humans in this difficult task of engaging oneself in the world, specially in these troubled times, than the Mbh. itself. This volume which is a collection of twenty-one contributions by scholars reputed in the area of Mbh. research is ample testimony to the above statement. In it we get a variety of approaches by different authors of the various chapters sometimes, to the same narratives like that of the birth of the Pandavas, at other times to the same character like Karna or Bhisma, and yet again to the myriad ways in which the compelling presence of dharma in the entire itihasa is to be understood. 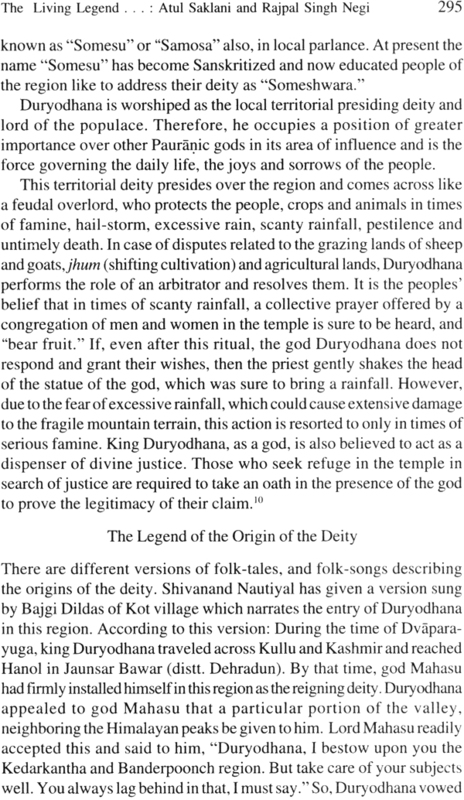 After all while the itihasa proclaims its all encompassing nature, it also emphasizes that it is primarily concerned with dharma alone when it states poignantly in the Svargarohanaparvan: With uplifted arms one laments that people are unable to understand the important principle that artha and kama are rooted in dharma. (urdhvabahurviraumyesa na ca kascicchrnoti me, dharmadarthasca kamasca sa kimartham na sevyate.) This volume also tries, in its own way, to reemphasize this teaching and is a refreshing new addition to the ongoing Mahabharata-itihasa scholarship. 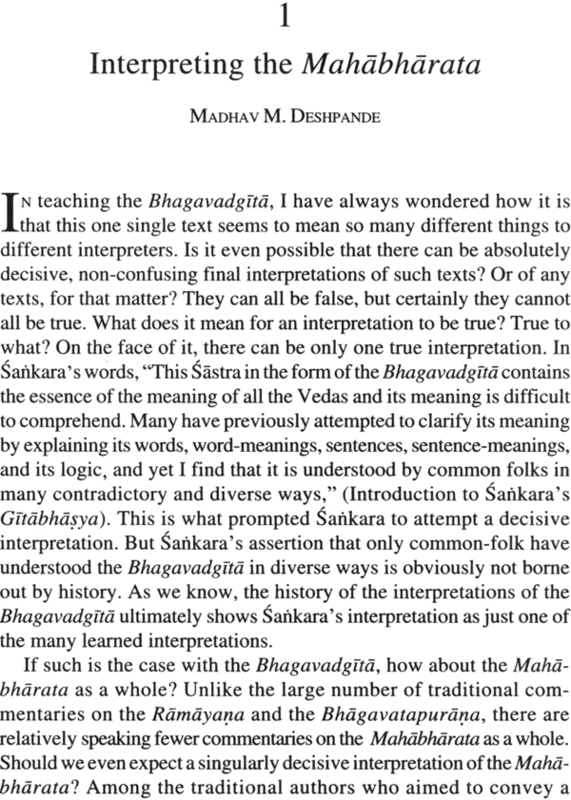 The first chapter by Madhav M. Deshpande raises some questions of perennial interest like whether there can be a final decisive inter- pretation of texts like the Mbh. Using the threefold transmission of the Mbh. 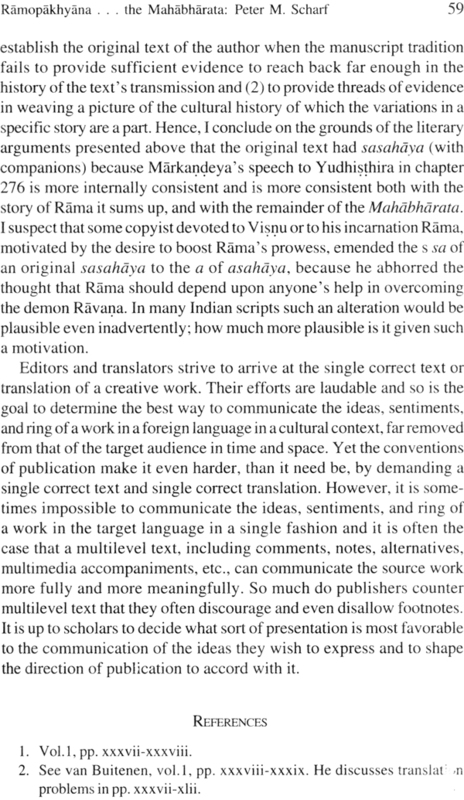 from Jaya to Bharata and Mbh., he skillfully argues that it is not the characters and plots but the "narrator, the patron and the audience" that dictate the form of a narrative act like the Mbh. He also discusses, in an interesting manner, when Arjuna really comes to know of Krsna's divinity and concludes that "Krsna's divinity is randomly introduced, without its narrative force being carried through in any consistent fashion." Barbara Gombach speculates on how the Mbh. could have become a smrti. She points to the itihasa strategy of interpretation as a marker in this enterprise. Using a cluser of narratives in the conversation between Pandu and Kunti regarding how best to obtain children, she finds the method of argumentation conforming to the principles of Purvamimamsa hermeneutical devices. Using ancient narratives to explain contemporary situations and structuring the conversation according to traditional Mimamsa rules lends a timeless quality to the Mbh. narratives, argues Gombach. It thus ensures a smooth transition of a story into a smrti and perhaps one can add, to the adage. itihasapurana bhyam vedamupabrmhayet. Knut Jacobsen draws attention to the several Kapila figures that occur in the Mbh. narratives. 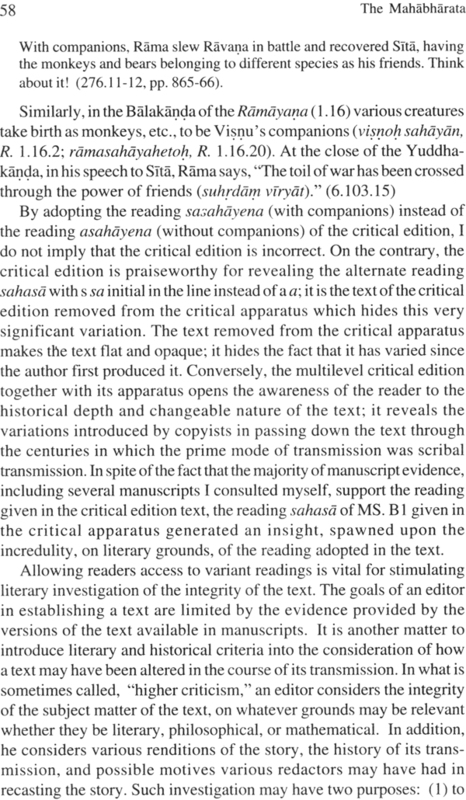 The editors of the Critical Edition accept Kapila as figuring in the dialogue twice, both representing two totally differing personalities. While one stands for the rsi who does tapas and is to be feared for his energy derived from tapas, the other is a defender of ahimsa and is concerned with ethics and moral behavior. 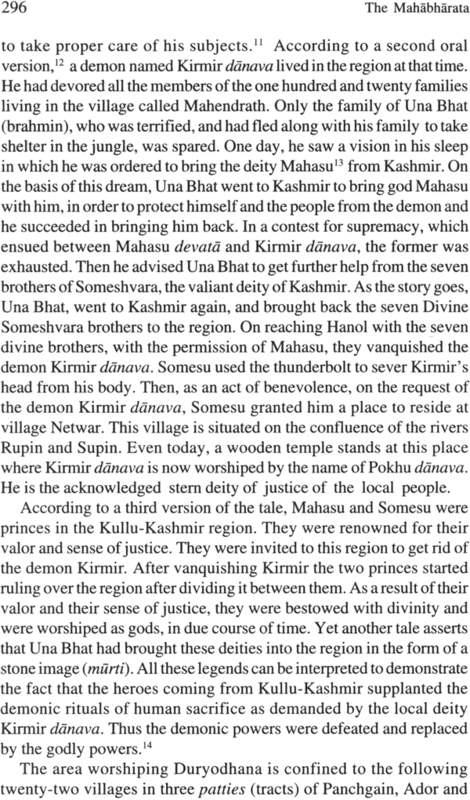 Knut covers a lot of ground in tracing the story of Kapila in myth, philosophy and popular Puranic stories. He also refers to the Mahanirvani Akhada who accept Kapila as their founding divine guru. are "not beyond question." He chooses three situations, one from the Dyutaparvan, one from the Vanaparvan and the third from the Santiparvan of the Mbh., that illustrate what he understands as the different perspectives of dharma. 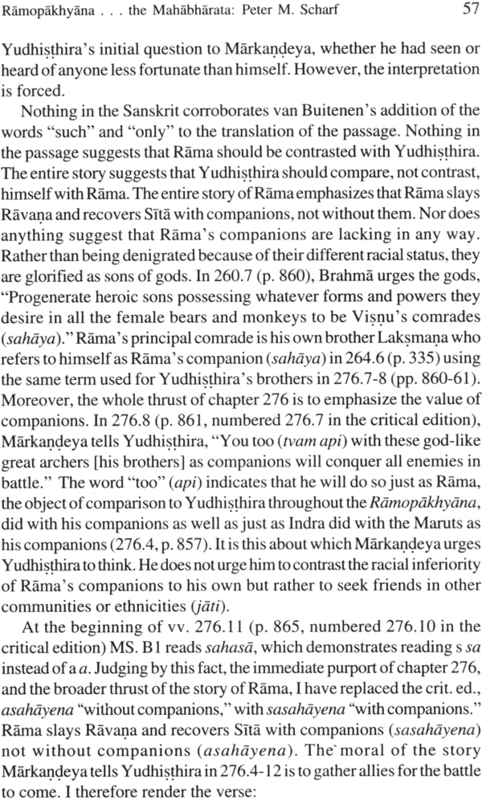 His conclusion that a "varied portrayal of dharma in the Mbh." 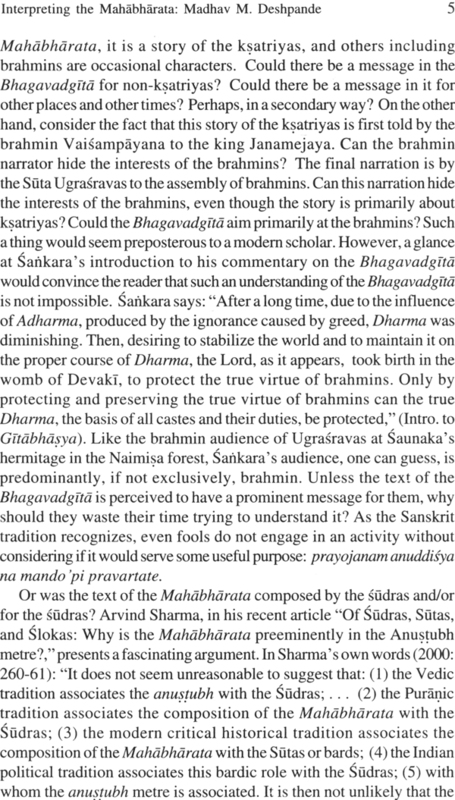 need not necessarily foreclose a "discourse about dharma" in the text, is indeed a valid one. Gerald James Larson confronts the question of the Mahabharata's meaning and seeks to answer it through comparison with an old tale from Bengal. The age old dictum that "hypocrisy, theft and killing" are very much part of living in the world and "of what it means to be human" are reinforced by this comparative tale. He further elucidates his own understanding of the meaning of the Mbh. by examining vv. 2.69, 11.12 and 11.33 of the Bhagavadgita from the adhidaivika, adhibhautika and adhydatmika levels and reaches some interesting conclusions. Nick Sutton continues to ponder on the tensions that arise in the interpretation of dharma. He categorizes the three domains of dharma as svadharma, sadharanadharma and ascetic dharma (morality) and discusses the tensions that arise between one and the other. He also situates these tensions historically within a post-Buddhist context, when the "major narratives" of the Mbh. were composed. 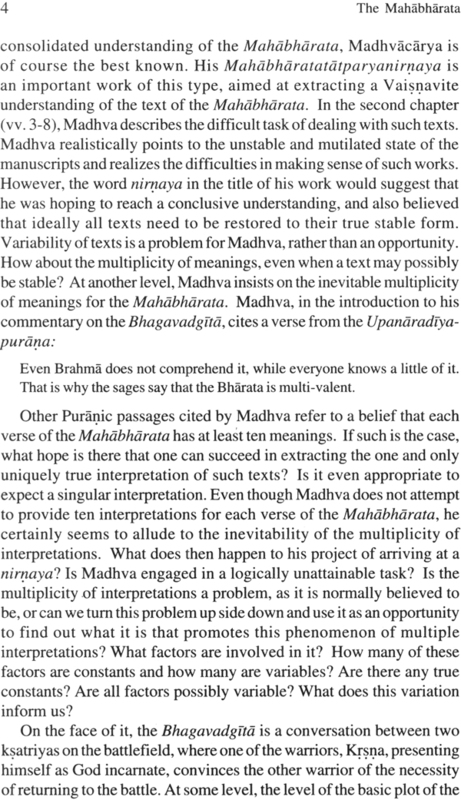 He also present arguments to substantiate his view that the Bhagavadgita is an integral part of the Mbh., both in its "principal ideas and teachings." Julian F. Woods addresses the twin concepts of daiva and purusakara in the Mbh. While conceding that there is a compelling presence of Daiva/daiva in the Mbh. he, nevertheless, argues that it is also challenged by the notion of purusakara or human initiative as well. 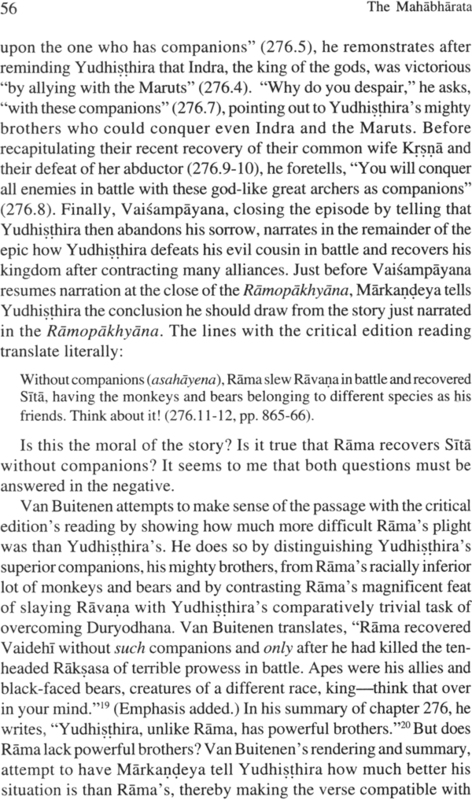 However, he also poses the question as to whether even this purusakara "may not ultimately rest upon the daiva itself." Aditya Adarkar diligently uses the character of Kama to explicate, among other things, the Tillichian phrase "the Anxiety of Meaningless- ness." Examining Karna 's courage at various stages as the story unfolds and contrasting it with that of Socratic heroism, Thomistic "perfect courage," stoic courage, or of a Neitzche who accepts that "God is dead," he draws the conclusion that Karna' s courage arises from a faith that is dharmic. In the ultimate analysis Karna's courage is one that is not "swayed by any external factor" but is simply rooted in his own faith in the meaning of dharma. Karna again is the subject of Christopher Chapple's chapter. For Chapple, Karna is the tragic hero of the Mbh., an "everyman" with whom humans can identify. He compares and contrasts Karna 's and Arjuna's conversations with Sri Krsna, both of which took place in chariots, one in the Udyogaparvan before the war with Karna and the other in the Bhismaparvan with Arjuna at the commencement of the war. Chapple likes to look at the Mbh. as providing models for "ethical decision making" in the world and examines Karna and Sri Krsna from a "contemporary moral theory" propounded by ethicists Kohlberg and Gilligan. His analysis leads him to proclaim Arjuna a pragmatist and Karna a romantic. 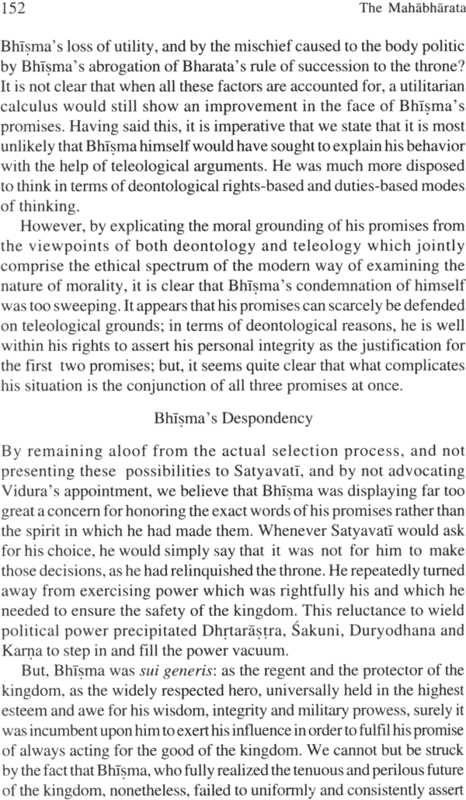 Gautam Chatterjee submits Bhisma's three promises that he made to Satyavati and her father to critical appraisal: first on de-ontological and then on teleological grounds. His examination leads him to declare that Bhisma's "condemnation of himself was too sweeping." 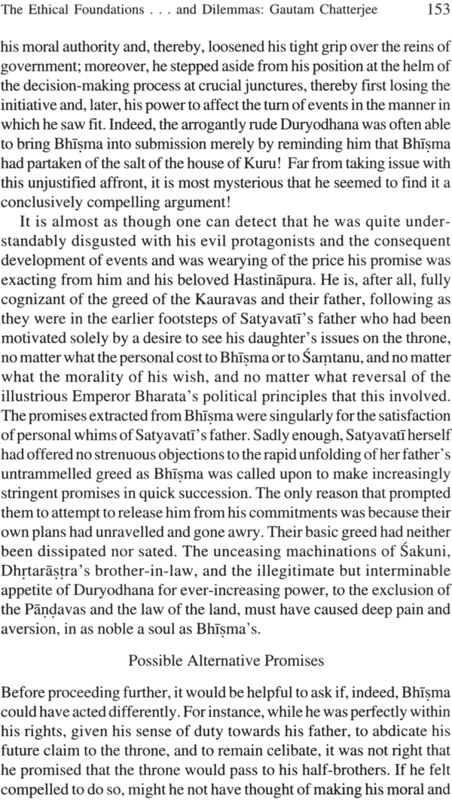 Bhisma, he says, was more concerned about the words of his promises rather "than the spirit in which he made them." 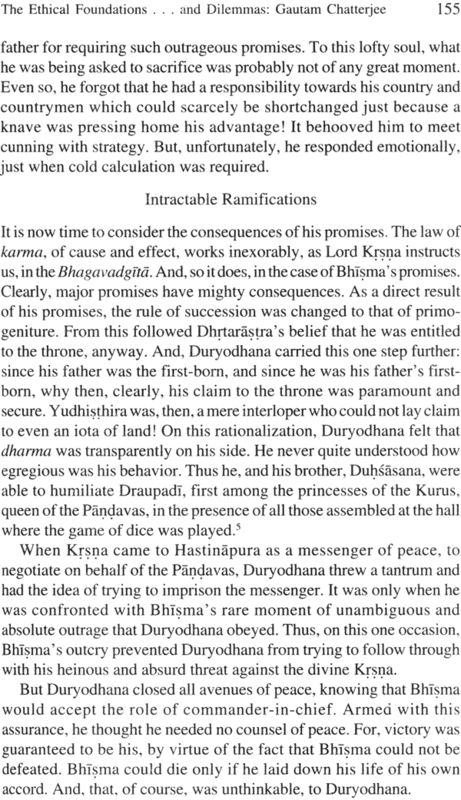 He lays down constructively, some caveats which Bhisma could have added to his third promise of spending the rest of this life protecting "whoever would sit on the throne of Hastinapura." This, in his view, could have saved the catastrophe of war and destruction. 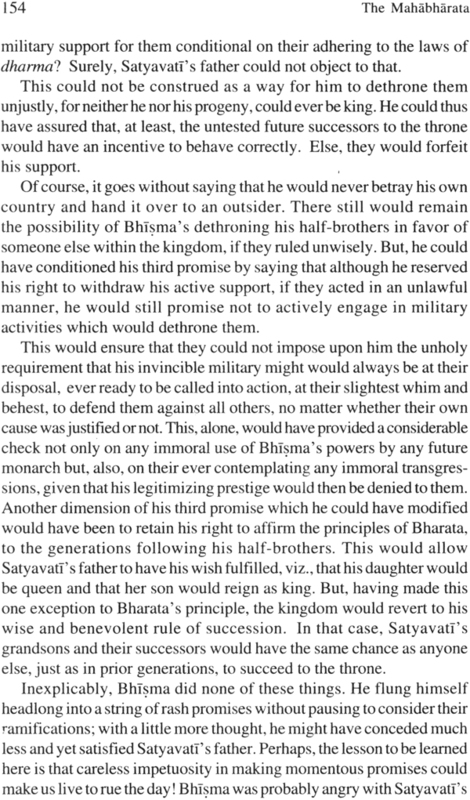 In spite of his upright character and devotion to dharma, an emotional response out of love for his father came in the way and tarnished the image of a noble character such as Bhisma, argues Chatterjee.